EN-ROADS - Energy transition pathways to achieve climate goals - Ventana Systems, Inc.
En-ROADS is a fast, powerful simulation tool for understanding how we can achieve our energy transition and climate goals through changes in our energy use, consumption, and policies. Sign-up to stay informed. En-ROADS focuses on how changes in global GDP, energy efficiency, R&D results, carbon price, fuel mix, and other factors change carbon emissions, energy access, and temperature. This simulation program runs in less than 0.1 second on a laptop, is transparent in its logic, and allows for testing of hundreds of factors, making it ideal for decision-makers in government, business, NGOs, and civil society. En-ROADS stands for “Energy – Rapid Overview and Decision-Support” simulator, and was created by Climate Interactive, Ventana Systems, the ClimateWorks Foundation Research Team, UML Climate Change Initiative, and John Sterman of MIT Sloan. What would we have to assume—about the technology, the economy, and the world—for a breakthrough to grow with enough speed and scale to deliver climate goals? En-ROADS has been featured in the journal Environmental Modelling and Software. The authors found that En-ROADS helps policymakers make optimal decisions, and that most En-ROADS users find win-wins in sustainable policy. Read the paper here. 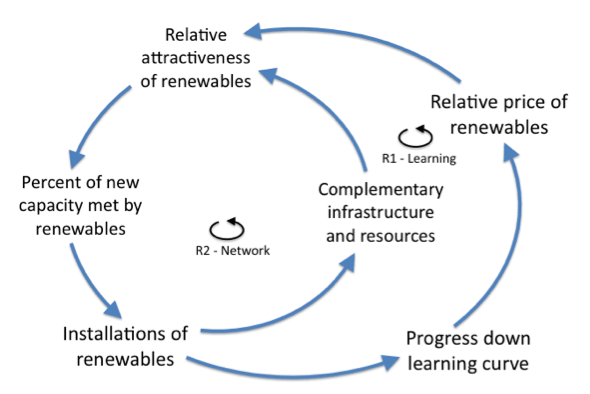 The simulation is built using the System Dynamics method, drawing upon the PhD theses of Dr. John Sterman and Dr. Tom Fiddaman, and thus emphasizes the dynamics of the transition to clean energy. That is, how long will it take for actions, investments, and policies to take effect and reduce emissions? When will action be necessary and in what order? The model emphasizes the system-wide interactions of policies. That is, how does energy efficiency affect renewable energy? What feedback loops, such as the learning curve, are important? The ClimateWorks Foundation originally commissioned (and co-designed) the simulation to help chart a path to climate success. Behind the simulation is an extensive study of the literature of important factors such as delay times, progress ratios, price sensitivities, historic growth of energy sources, and energy efficiency potential. 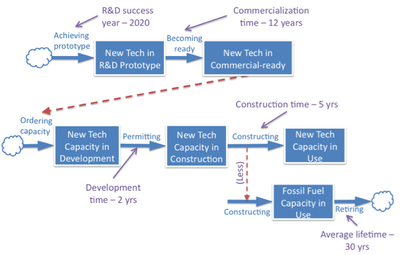 One of the most innovative parts of En-ROADS is its capacity to test assumptions about the potential success of R&D towards zero-carbon energy. 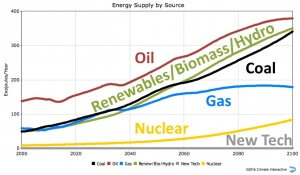 The simulation asks: What are the likely dynamics of the emergence of a new energy supply? How fast could it grow and displace high-carbon sources and, thus, reduce carbon emissions? A diagram of some of the structure is shown to the right. 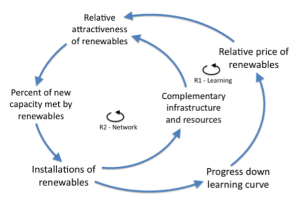 En-ROADS is a global model that focuses on how changes in the energy, economic, and public policy systems could affect GHG emissions and climate outcomes. The simulation is presently entering an external review. It is also being customized to address other questions and other regional scales. The RPX real estate index, based on algorithms invented by Ventana, enabled one of the fastest-growing derivatives markets ever. © 2016 Ventana Systems, Inc. All rights reserved.